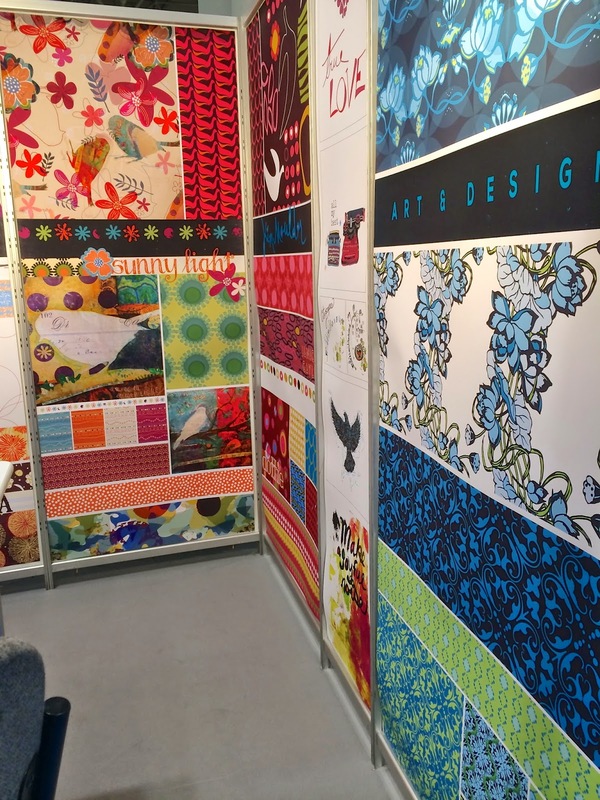 It's been six seven weeks since Surtex. I can hardly believe it. request for more images from someone last week. I try to remind myself that everyone is just as busy as I am (more so!) and I have to be patient. I've been so preoccupied with the last week of school, then a week at the beach with the kids, and now just playing catch up around the house and trying to entertain two kids that would prefer to lay around watching tv or playing video games all day. So everything has seemed to be on hold for a little while. I am itching to get busy with some new artwork and I have several things simmering. Summer is always hard because it's stop and go with the kids home, plus I always feel like there are big piles of schoolwork, clothing, toys, dirty floors, and loads of laundry always calling. I just read this from Pinkaland on Medium today about balancing home and work life. I'm considering it . . . especially with a few freelance jobs on the schedule. 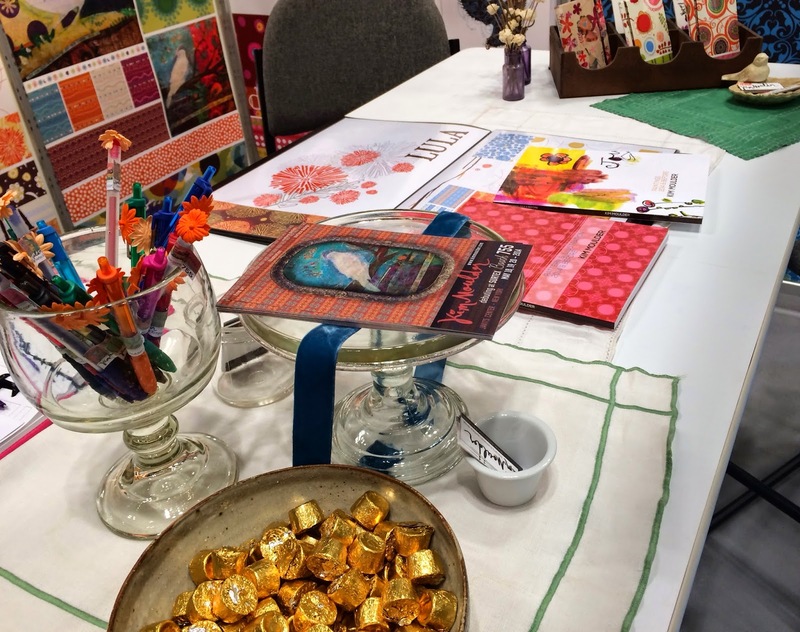 But first I promised to share a little bit of the nitty-gritty of my surtex experience. 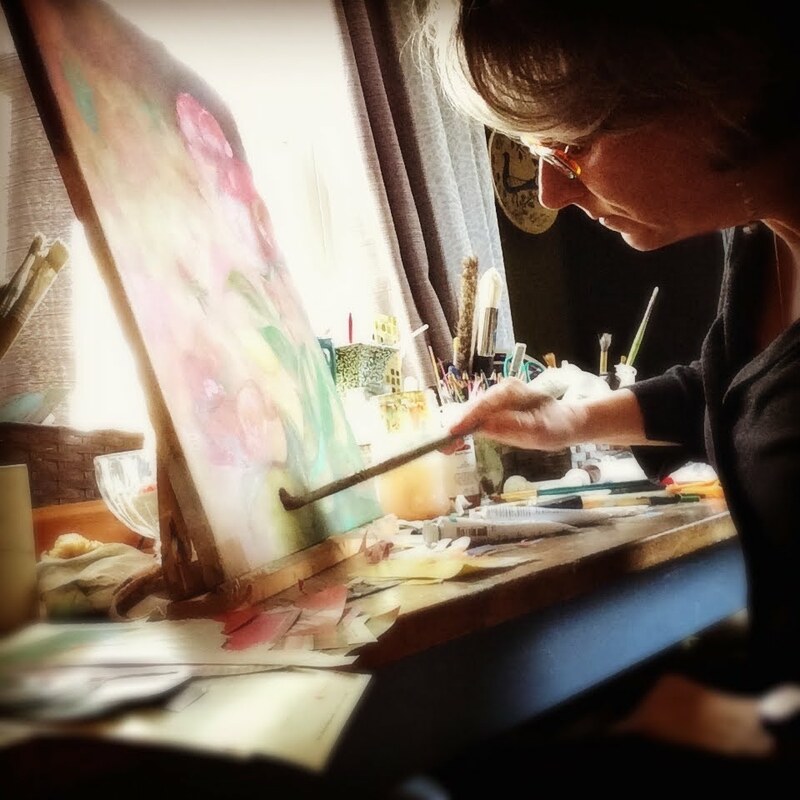 When I was preparing I read posts from so many other artists about what they learned. It was invaluable to me. If that support and information had not been there I am sure I never would have had the nerve to do this—or the know-how. So I'm paying it forward by telling my story. What went right, what went wrong and what I will do next time. 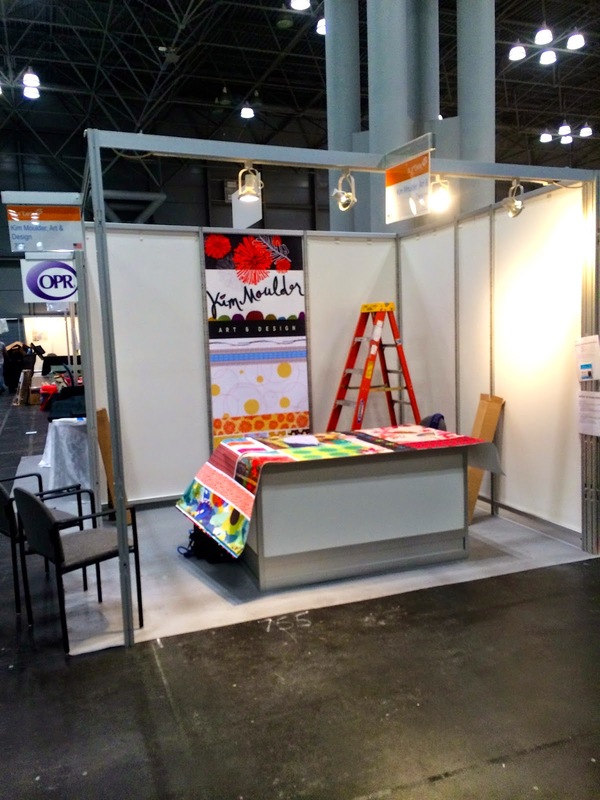 I hope this will be of help to those making plans for their first Surtex show—or any tradeshow for that matter! 1. Banners I decided early on that since I had no licensed products to show off, and only a few handmade products, my banners must be the centerpiece of my booth. I am a graphic designer so this made sense to me and I focused fully on pulling a presentation together that would showcase my collections in a dynamic way. For a while I've been worried about all of the different ways that I work. Watercolor, mixed media, collage, pen and ink, digital, painting, illustration, graphic design. . . and the list goes on. I worried that with so many different techniques and mediums that the presentation of all this would be a detriment to showcasing my work. 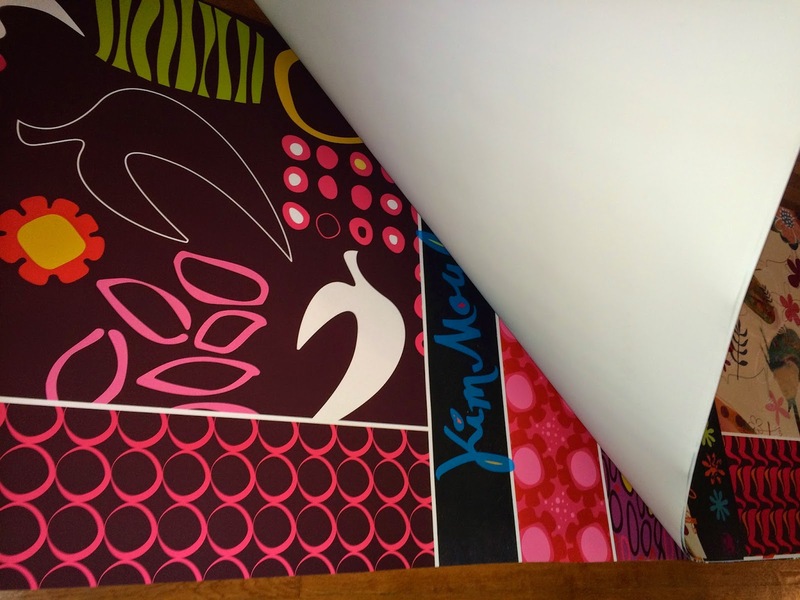 So, in the months before Surtex I really worked hard on pulling it all together in a way that would make sense. I wanted the collections to stand on their own. But as I gradually built the booth design, I realized that the colors and different styles really worked well together—it all was making sense visually. I'm amazed at how it happened because although some of it was conscience decisions with colors, patterns and themes, a lot of it really happened organically. And, in the end, it all looked like . . . Me! I decided to use 4over.com to print the banners. Nicole Tamarin (whom I sadly neglected to meet and thank in person, after she was kind enough to text with me about it!) —she had highly recommended them as well as other artists online. After researching several vendors, I decided that the price was reasonable and even better, I was able to choose the exact size I wanted—which mattered to me in the end. The cost for five 3-foot banners and three 18-inch banners was about $575. I decided to order them without grommets because I wanted a clean flat surface. And I ordered paper, 13 mil, which I had heard takes color really well with no glare. I did not want glare with all the vivid color. I was afraid that any glare would make it seem garish. Just like Nicole had said, they came speedy fast, which was good because I ordered them two weeks before Surtex AND, there was a problem (some weird ruler graphic I'd never seen before showed up on two of the banners—just something quirky that happened on their end) I had no trouble creating a problem ticket and emailing photos of the problem. They reprinted and mailed new ones in a matter of days. I had been so worried about the color because that is one of the things that sets my work apart. It had to be right—and the outcome was more than right, it was PERFECT. Better than perfect—breath-taking! (I can't even believe I can say this about something I did!! I've never been so pleased and confident about something I have done! yay!) I was so happy, relieved and oooooh! —excited. If everything else was a bust—it didn't matter because I had the most important thing in my hands and it was more than I had imagined it would be. whew. Once I ordered my banners, I went full throttle into my portfolios. I wanted to make books on blurb.com. I had seen some beautiful portfolios printed with them, and I had actually designed and printed a photography/poetry book in which I was extremely pleased. So I got to work. 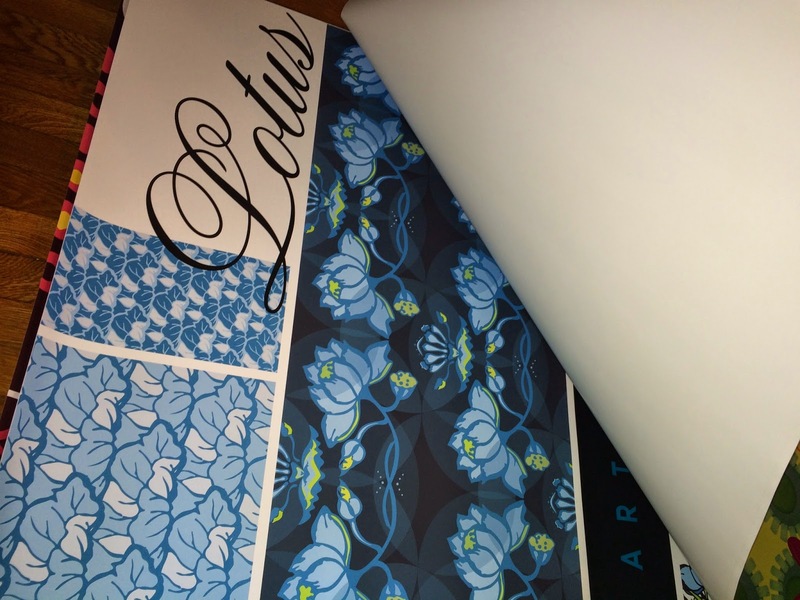 I wanted two books—one for my patterns and illustrations, and one for my fine art paintings. I had been designing and pulling my collections together all along and continued to do more as I saw a need while creating these books. The books actually helped me to see what I had and see where there were holes that needed filling. They were really useful in this way. I worked and worked and worked. Every waking minute that I could. It was important to me that I didn't cut corners in the books because I wanted people to have the opportunity to be intimate with them and that meant that they would be looked at closely. I worked up until the Saturday a week before the show... yes. 3AM Saturday morning. I finally finished and ordered the books. I knew I was cutting it very, very close. But it couldn't be helped. I'd rather not have them then have them incomplete or not up to par. Earliest they would arrive would be May 22. I frantically searched for the invoice of my other book I had done with blurb.com. to look at the order date, ship date, and delivery date. It had taken two weeks to get my other book and it arrived one day early. There was no way I would get them in time. 3. Ask for advice in Facebook groups. Chatting things over with people who KNOW is the best thing to do when you run into snags or start getting nervous! So if you take classes, participate in the groups. 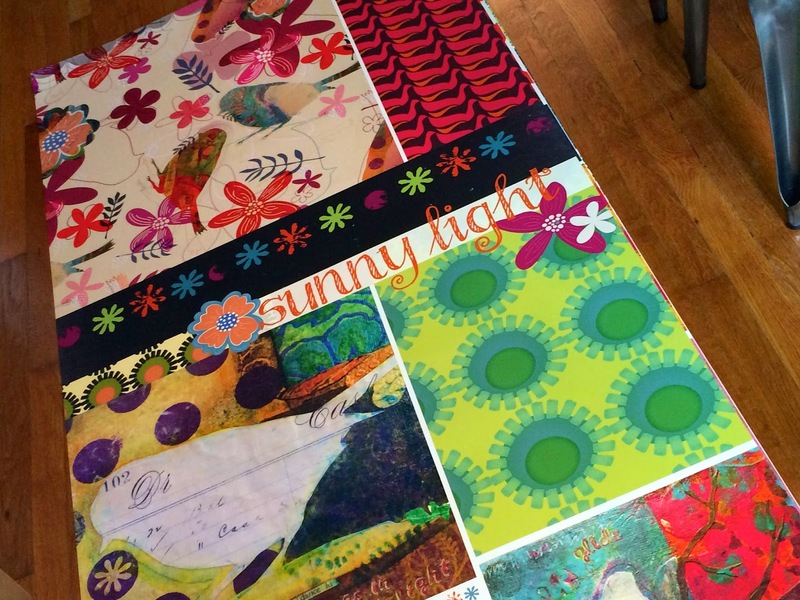 If you are planning for Surtex, join Facebook or Linkedin groups and be active. If you know someone nearby who is in the business, have coffee with them and go over what you are doing and have left to do. Do these things and you won't feel so alone in this dream you have. Two good pieces of advice I received about my portfolio problem: have Blurb.com ship to my hotel. Then if they arrive before the show is over I will have them for at least part of the it. 4. Make things right. So with portfolios I had a plan, but I still wanted a hard physical book. I think it's because I like the idea of touching it and holding the images—big—right in front of you. And it feels faster somehow? More immediate? So, I rearranged some of the book into 11x17 pages. I thought I would just print them at Staples—to be quick and easy—I only had two days left. They printed them on card stock on their color printer. . . . ick. At that point (Thursday! ), I went to a local printer that does beautiful art prints and had them reprinted in one day (I'm leaving for Surtex in two!). Pricey, but perfect and just right. I slid them into my new black portfolio, cut my name/logo off of one of the signs from Staples that I didn't like and slid it into the spine—done. I convinced myself that when you are spending this much money on something that is so important to you— (if you can) spending a little more to 'fix' things is what has to be done. And they were scheduled for delivery at the hotel that afternoon. I didn't get to see them until after I'd set up on Saturday and made it back to the hotel to check in. But they were beautiful. I was over the moon happy. I think there was someone making things happen in the background because these two books got there an entire week early! my 11x17 portfolio book I made myself. More is better if you can use them later. . . I decided to do these at the last minute and didn't spend anything on them. I had some pretty sparkle green envelopes in my stash. I cut the flap off with craft scissors that had a pretty scollop. Then I created two sheets—one with my Profile and another with all of my social media links. these were cut so that you could see each one stacked up in the envelope. Then my larger postcard and a couple of my smaller ones. 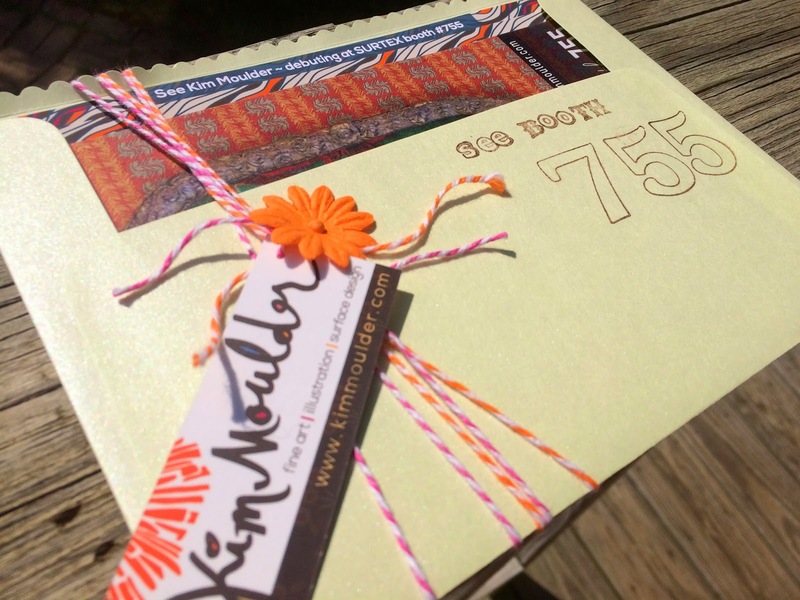 I stamped the outside of the envelope with my booth number, wrapped it with colored baker's twine and tied a hole punched business card into the twine. I finished it off with a cute orange paper flower stuck with a little glue dot. Next time: Jean ran the press kits up for me on Sunday morning but I never did make it up there. Next time I will make a point to get up to the press room to see how many of my kits were picked up. I have no idea. I know that I left about 12 kits there. On Monday Jean walked up there and said that two had been picked up. I kept thinking about checking again but then the time got away from me and I never was able to. I hope they went to good use—Makes me sick that they probably ended up in the trash. :( Next time I will also make a few more so that I can give one to those potential clients that seem genuinely interested in my work. Set-up went smoothly. Until I realized that I bought the wrong kind of command strips. I meant to get the kind that is velcro. But the sticky kind worked just as well. Another problem arose—I didn't have enough. But, my friend Jean was able to get some at the Duane Reade's before coming to help me on Saturday afternoon. We still had to get some more on Sunday morning and finish up before the show started that day. Lessons learned about booth setup: Buy extra command strips if that’s what you are using. And: print out the page when you order your desk and chairs. ~ I had ordered (or I thought I had) the tall desk and stools—thinking I wanted to be able to stand but have something to lean on. But, perhaps the order didn't go through because I was not on the list. So they gave me the "default" lower desk and chairs. Luckily there was an abandoned desk in the aisle so my neighbor helped me trade out my low desk for the tall one. Now the banner for my desk would fit! yay! But —I still had the low chairs and they looked kind of goofy. I tried to get the people in the back to change them out but they said it would cost me over $100 to switch to the stools. I decided just to make do by turning the chairs backwards and leaning on them behind the desk when I needed too. But then on Sunday morning, two ladies, part of the Surtex management team (GES), came by to check on how I was doing. 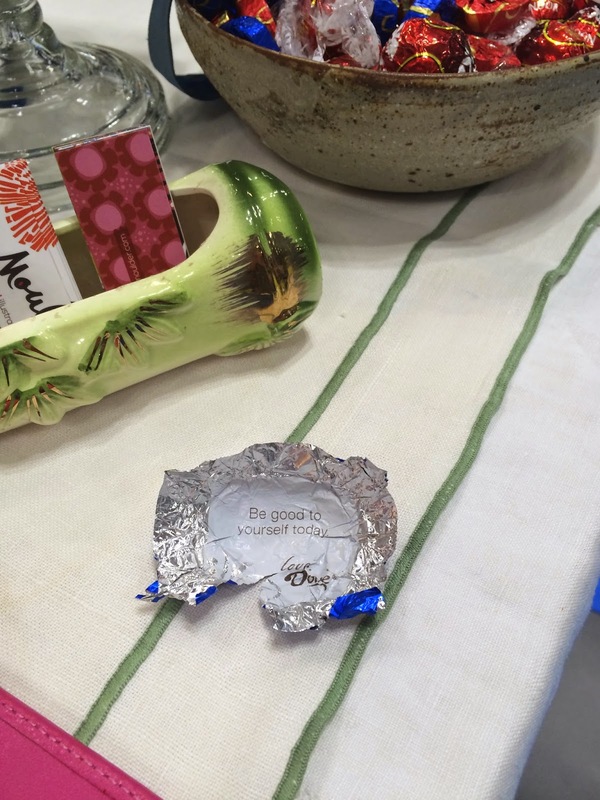 (Oh—and I did offer them chocolate and a pen which they loved!) I told them about the stools and what had happened. They immediately called someone to bring me some stools and took the chairs away—no charge. wow!! I was happy happy. One of my new tall stools. they are on their way. . .
8. Be happy when they change you to a corner booth at the last minute!! And I was! Luckily being late getting my banners together paid off because I had not designed the whole booth when I found this out. It was an easy fix and I liked it better! 9. Wear your favorite clothes. Whatever makes you feel your best. 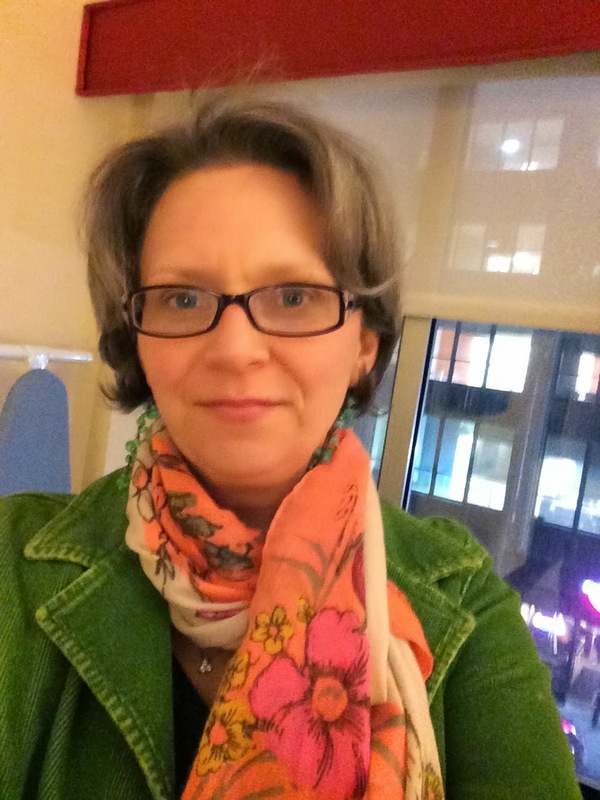 I did wear a smaller scarf one day (~the next pic, another of my favs), but it is from the 1980s (yes it was mine back then and I still love it!) I also wore my favorite vintage jacket. (the creamy lace one) My grandmother made that jacket which was part of the suit my mom wore as she left her wedding. It's my favorite thing! So, just wear what makes you feel good. The most important thing is to be yourself. Favorite vintage jacket, earrings and scarf. 10. Be a friend to those around you! I had such nice neighbors and they were very helpful so many times. I enjoyed talking with them in the slow moments and really learned so much. We were all very diverse with different goals but all with one common one—to make lots of connections. Thanks to all of them (near and far) for being so kind throughout the whole show! along with her partner Anna Browne from London. amazing group of talented Illustrators. 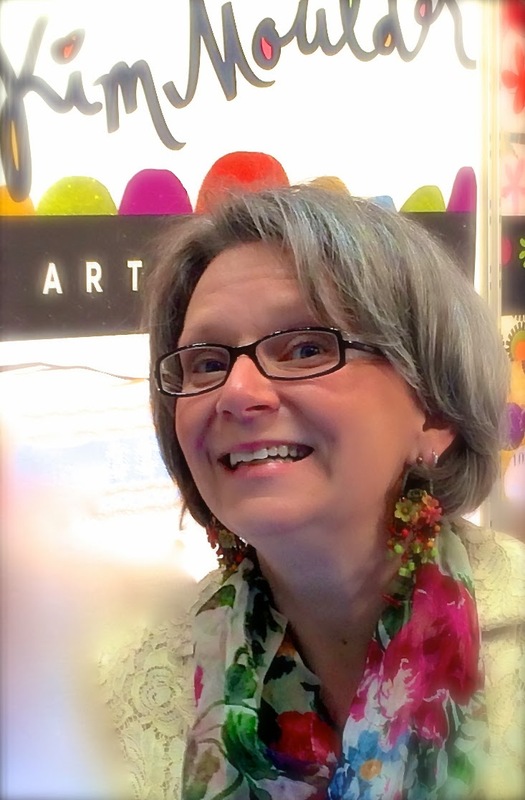 Michele Van Patten, Artist and Illustrator. 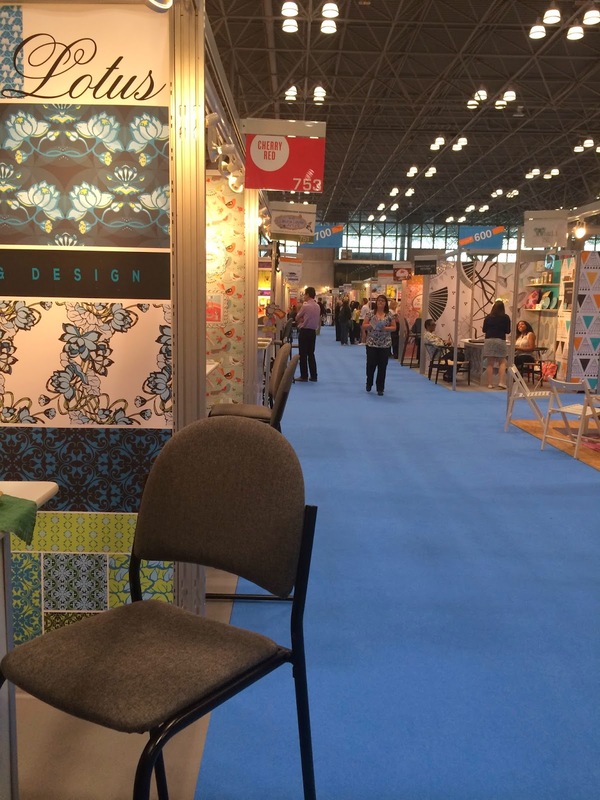 Her first time at Surtex. story! They drove a long way to get to NY! ~ make marketing and contacts a bigger priority early on. ~ contact clients I hope to work with to let them know I will be there. ~ have product to show and my own fabric to use on the desk. ~ take a trip up to the press room. 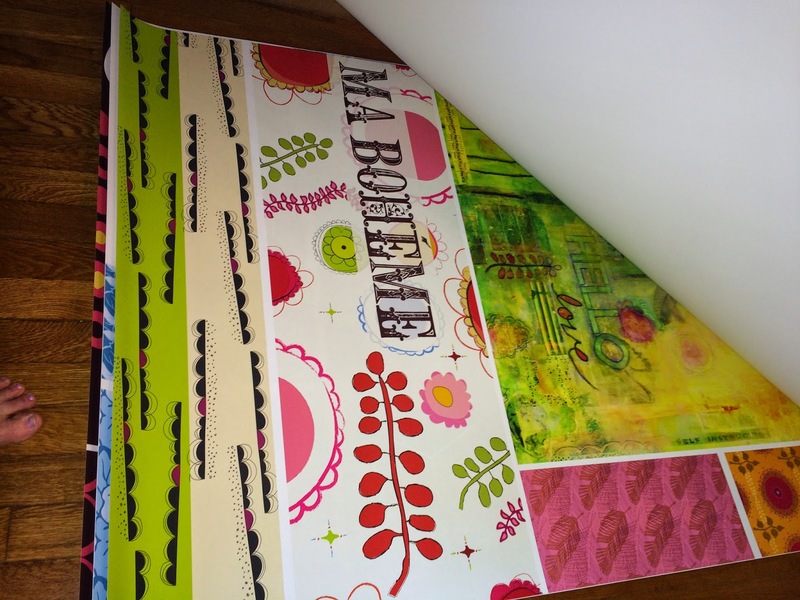 How I planned for Surtex in under 8 weeks!